“Death is at work in us, but life is at work in you.” As Jesus died to Himself at Gethsemane in accepting a death which He wished He could escape, so we die to our desire to resist or refuse what … continue reading. 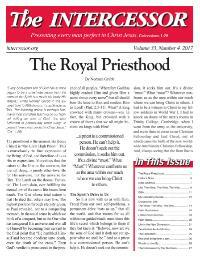 As 2017 draws to a close, we begin this issue of The Intercessor exploring the summit of God’s purpose for us as “heirs of God, and joint-heirs with Christ” (Rom. 8:17). Our lead article, “The Royal … continue reading. If, then, I am as He is, how does it work out in practical life? It means a revolution in my outlook. Normally, I interpret all happenings of life in terms of their effect on myself. My physical … continue reading. Ruth dear, So glad you continue leaning a bit on this shoulder (really His in a human form! ), and I enjoy being loved and love--at a distance! I’m just home from our great six weeks in Britain, … continue reading. We conclude our excerpts from Page Prewitt’s booklet, "Life: The What, The Who, The Why." What About Sin? The Bible simplifies sin when it makes the bare bones statement that everything not of … continue reading. “Every born-again son of God has at once begun to be a priest-intercessor from the moment the Spirit has made his body His temple,” writes Norman Grubb in this excerpt from "To All Believers: It's as … continue reading. Question: I know the Bible says, “In all things give thanks,” but how can I reconcile the love, goodness and care of God with the pain and suffering I’m going through? What is God’s purpose in … continue reading. 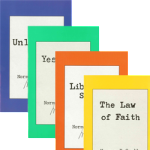 The Liberating Secret is one of my favorite books by Norman Grubb. The biblically-based “total truth” which he systematically outlines in this book has truly changed my life! I want to tell the whole … continue reading.